You can never have too many aspics! 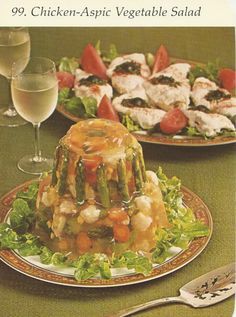 Just when you think you can’t fit another savory aspic on a buffet table, you’ll find you can with some clever rearrangement. Aspics are always everyone’s favorite! I’m sure you’ll see when my cookbook 50 Recipes on the Aspects of Aspics comes out. It’s perfect for busy housewives! Aspics are also great conversion pieces. Aspics can be made with so many things like bologna, tuna, or even jellied beef tongue! They’re perfect because they are so versatile! It’s the magic of aspics!